Our holiday home is bright, comfortable, clean and spacious with an open plan living room with kitchen and dining area with stunning views from each window. We have a lovely open fire and a regular supply of turf to burn. We have a seperate WC downstairs as well as a large double bedroom and ensuite. There are a further three bedrooms upstairs plus bathroom. There is one room with a double bed, One bedroom has twin beds plus a double sofa bed and the fourth bedroom has a single bed with a further pull out bed beneath. Outside we have a deck area with patio table and chairs and barbecue. There is also a children's climbing frame and slide. We spend as many weekends as possible as it is a great place to relax. We use a pay as you go dongle to access the internet which is very effective. We are both from Belfast but like to spend as much time in our holiday home as we can. Aidan is a special needs teacher and I am Deputy CEO of a charity. We have a little 8 year old boy. We have now completed five exchanges and find it a really great experience and a wonderful way to really experience other peoples cultures. We are very respectful of other peoples property and our little boy is too. As this is our holiday home, it can be non simultaneous. We will respond to all those who contact us. 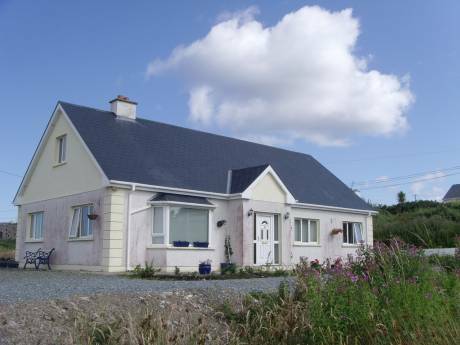 Situated in North West Donegal our home is set in a superb location overlooking the bay and the islands, five minutes walk from Bunaninver harbour and a three minute drive to the nearest sandy beach. The beach provides ideal conditions (weather permitting!) for bathing, walking, and jogging with the invigorating sea air. A local leisure centre includes a gymnasium and swimming pool. A five minute walk is Teac Jack's hotel, renowned for its traditional music and dance sessions and good "pub grub". 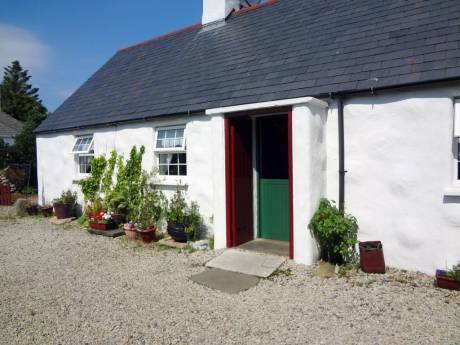 A short drive away is Bunbeg, which boasts more beaches, golf, fishing, hill walking, restaurants and traditional pubs. This is in the heart of the Gaeltacht, the Irish speaking area. 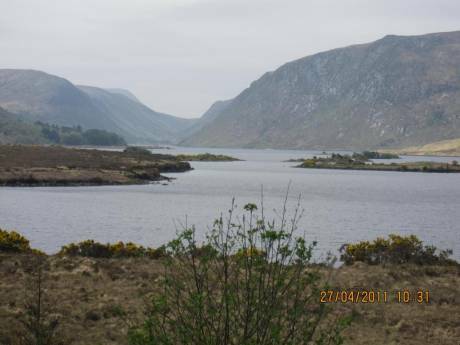 The Dunlewey visitor's centre and children's play park is also a short drive, or travel on to Glenveagh National park and take in its breathtaking scenery. Donegal airport is less than 30 minutes drive and there are daily flights from and to Dublin. There are so many places to visit which are within easy reach throughout Donegal and beyond but two world famous are less than two hours, the Giants Causeway and Bushmills Distillery. There are many connecting flights to and from Belfast which is 2.5 hours journey.